Turkey is usually the star of Thanksgiving Dinner, unless of course you’re part of my family. (More on that later). Nonetheless, the turkey is the source of so much joy yet stress during Thanksgiving. So many of us wonder whether we’re going to cook right, will it be juicy?, How big is too big? After years of roasting Turkey, I can definitely say– it’s not as hard as you think. We all tend to psych ourselves out and really who can blame us? As soon as November 1st rolls around most of the programming on TV is about roasting the perfect turkey and coming up with the perfect marinade. There are many camps when it comes to Turkey as well. You have those who swear by brinening, others who insist that you inject the turkey, then you have those that only eat fried turkey, and others who won’t roast a turkey unless it’s in a bag. I can honestly say that I’ve tried most if not all of the methods of making a Turkey. The thing is, my family is not crazy about turkey. **gasp** Sure we make it year after year, but the true star at Thanksgiving is the Pernil. We make a Turkey as an homage to the tradition but in reality, we buy the smallest turkey that we can find because there’s only a handful of us who eat it. Lucky for me, this means that I get to experiment with the Turkey year after year– and I have. My absolute favorite way of making Turkey is to sous-vide first and then fry it. It’s a style that my boyfriend’s brother taught me and it has been a favorite ever since. Nonetheless, a few of my other favorite are Bourbon Glazed Turkey, Jerk Turkey, and of course, Pernil Style Turkey. Are you surprised? Pernil Style Turkey is literally just that- it’s Turkey marinated and cooked as though it were a Pernil. The results are a juicy Turkey with classic undeniable delicious flavor. It’s also the Turkey that my grandmother would make year after year until I took over the responsibility of making the Turkey. I knew her Turkey was AMAZING but I hated seeing no one in my family be excited for it. I saw this as an opportunity to experiment with different flavors. If I succeeded then, yay and if I didn’t? Well… it wasn’t like my family was going to really eat the Turkey anyways! Now imagine the breath of fresh air when I met my boyfriend’s family. They love Turkey. They roast it, fry it, stew it. You name it. They are a Turkey family! It was incredible to see because for as long as I have been having Hispanic Thanksgiving, The Turkey was never the star of the show. Tip #1: Allow the Turkey to defrost for a few days. Most turkeys are sold frozen and need to defrost in the fridge for a few days. You can take some shortcuts but then you risk getting sick. Tip #3: If you’re going to use Aluminum pans, double up. You’ll thank me later. If you pierce a small hole in the aluminum pan, you have the double layer to protect you and your oven. Otherwise, you’ll have a house fill of smoke and Turkey gravy that’s made an absolute mess in your oven. Tip #4: Brine your Turkey someway or some-how. You don’t have to get fancy and brine it in gallons of water for a few days. However, you could wash it and let it sit in water, vinegar, and lime for at least an hour or two. I personally find that this does make a difference in how juicy gets. Tip #5: Let the Turkey marinate for at least two days. One day if you’re in a pinch or rush. Turkey is relatively bland. I also find it has a strong bird-like smell and taste. As a result, I recommend marinating it for a long time to kill of some of that gaminess. 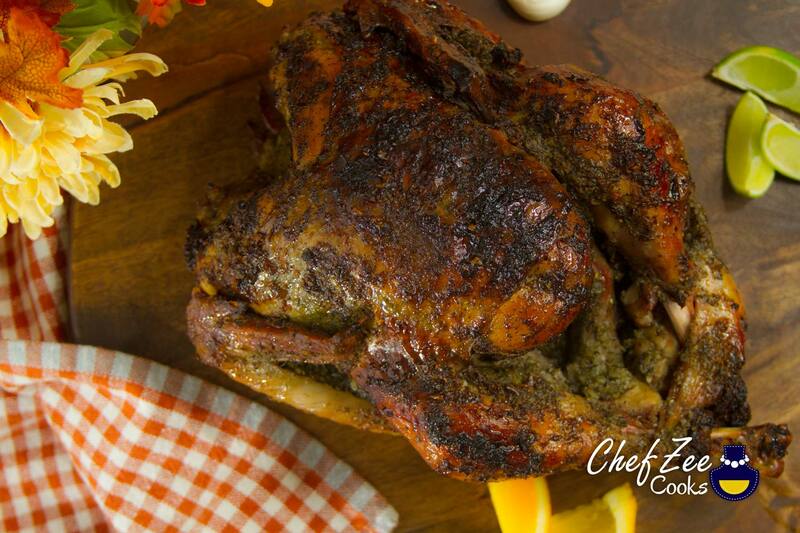 Tip #7: Slow roasting your Turkey covered will give you a super juicy and tender Turkey. Only cook it uncovered at the end to build color. When in doubt, cover it back up. Tip #8: If you’re planning on stuffing your Turkey, allow for extra cook time. Stuffing your turkey delays just how long it takes for your Turkey to cook. Tip #9: Don’ t throw out the neck-bone. EVERYONE has someone in their family that loves them a Turkey neck-bone. If you don’t, freeze it and use it to flavor stewed string beans or collard greens. Thank me later! Tip#12: When roasting your Turkey, know that you have bake 15mins per pound and your Turkey is done when it reaches 165 degrees Fahrenheit! If this is your first Thanksgiving and your first time roasting a Turkey, know that you are not alone. It’s a right of passage and as soon as you’re done, you’ll realize that it’s nothing to sweat. Just think of it as another Pollo al Horno or Pernil. The techniques are all the same! I made my first Turkey in the Fall of 2009. My college roommate and I decided to celebrate Thanksgiving together in our college apartment. We had no idea what we were doing but we ended up with a magnificent Thanksgiving Feast. We stressed out mainly about whether or not the Turkey was done. Luckily, our Turkey came equipped with one of those red stoppers. Since then, I’ve known to look out for them as a fail-safe for newbie cooks. Another fail-safe is a meat thermometer. When in doubt, test it out! Here are some kitchen gadget and tools that I recommend to get your Turkey to A1 Status! This thermometer is great for newbie and seasoned cooks alike! It’s digital and wireless which means that you can place the probe into the Turkey and put it back into the oven. You can read the temperature on a separate screen without having the oven door open. You can also have a cheat sheet for any other meat or fish that you cook as the temperatures come pre-set. This roasting pan is just as good as the Tri-Ply stainless steel but admittedly so, it’s much easier to clean. This is great for newbie and seasoned cooks alike. I personally like it because it’s easy to maintain and a great intro roasting pan for those who may be scared of stainless steel kitchen pans. In general, Calphalon makes some of my favorite hard anodized non-stick pots and pans, period. They last forever! The only drawback is also the price but you can easily find this at budget stores like HomeGoods and TJMaxx. 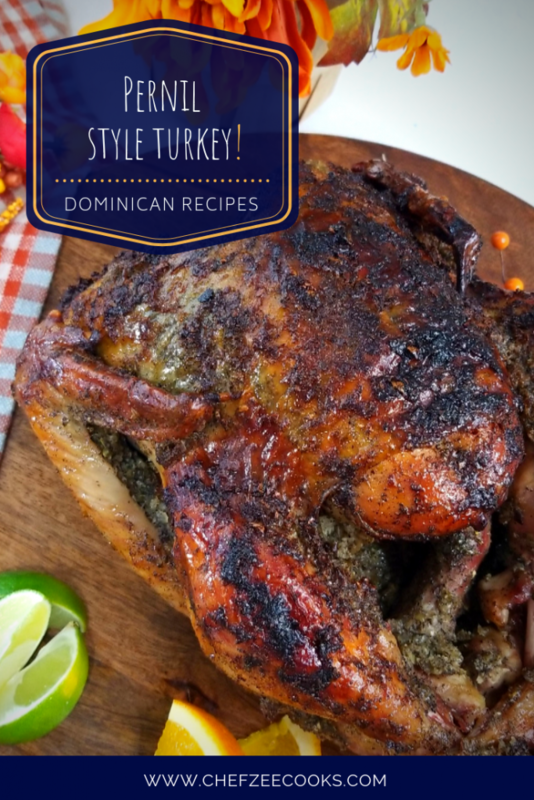 If you’d like to see an easy to follow step-by-step video on How to Make Pernil Style Turkey | Pavo Dominicano visit my YouTube Channel: Chef Zee Cooks! And now the moment you’ve all been waiting for… the recipe! Cover Turkey tightly with aluminum foil and bake for 2.5 hours at 325-350 degrees Fahrenheit. Feel free to use whatever roasting pan you like whether it's one of the two that I recommended or a disposable one. Just be sure to bake covered so that Turkey doesn't dry out in the oven. Enjoy with your favorite sides! Now that you’re Turkey is roasted to perfection, feel free to enjoy with some of my favorite Holiday Side Dishes!